One of my early paper dolls with an elaborate background. Today, I want to talk about Artistic Quality and my belief that paper dolls should be beautiful both before and after they are cut out. Listen, let’s do something radical for a moment, let’s think about Art. No, let me say right now that I do not think of myself as an Artist. I just don’t 99% of the time. I am an avid doodler, a lover of paper dolls and someone who likes to draw. But in that 1% of the time I do slip into that Artistic Head-Space, I realize a few things. The first is that paper dolls are not fine art. There, I said it. Now before people get out their pitch forks, let me tell you why. Art is useless. By definition, a piece of art has only a decorative function. And this is wonderful. Making art is part of what makes us human and we should darn well continue doing it, but paper dolls are toys. One of my more recent paper dolls with her custom background and layout. So, I think of paper dolls not as an art form, but more as a craft like sewing or quilting or knitting. However, in the 1% of the time when I enter Artist Mode, I do consider two things. The first is that paper dolls actually exist in two states. State One is as a flat print object of a doll figure and her clothes. Sometimes, as a booklet, but often just as a flat sheet. State Two is when the pieces have been cut out and then the paper doll can be fully realized as a toy. If a paper doll is art, it is when it is in State One- flat sheet mode, before it has been cut. Sometimes I use the same backgrounds on all the paper dolls in a series for coherence. So, when the paper doll is just a sheet it needs to be attractive, just as it needs to be attractive when it is cut out. The point I am making here is this- Layout and Format Matter! The backgrounds I put on my paper dolls are there, because I think it makes for a more attractive work before it is cut out. So, I charge anyone who is thinking about these issues to go look at their favorite paper dolls and notice the layout, notice the time spent thinking about spacing, about placement, about clarity. These things are all important. It’s not just about the doll and her clothes, it is about the whole experience. I used photos from SenshiStock to illustrate this post. Specifically, I used Sailor Sakky Walking Stock, because it was a neutral pose. In the “Heads Method” The average female figure is 7 heads or 7.5 heads tall. The .5 head accommodates the length of the foot. Some people go with eight heads, which gives you a longer leaner figure. Fashion illustration often uses nine heads with the extra head usually put into the length of the legs. The width of the shoulders is usually 2 to 2.5 heads. The hips at their widest point measure 2 heads and the waist usually measures 1 to 1.5 heads. Now, let me be clear: No one in the real world has perfect proportions, but these numbers can act as guides for when you’re working on a figure. But wait, you’re thinking, your paper dolls have HUGE heads. How do I manage that? I actually prefer to think in ratios. I find it easier than thinking in heads. In the “ratio” method, the body is broken into parts and they are measured based on the size of other parts. For example, the distance from the top of the head to the waist is one third. The distance between the waist and the knees is another third. The distance between the knees and the bottom of the feet is another third. This creates an elongated figure who is nine heads tall. On the left above is part of the B&B series. As you can see, she had the same distance from the top of her neck to her crotch as she does to the buttom of her foot. In short, she is proportional, ignoring her huge head. On the right is Monica of the Marisole Monday & Friends Family. Monica is NOT proportional. I wanted to show that NOT ALL my paper dolls have proper proportions. However, the more I draw, the more I find I like things better when I do pay attention to my ratios. Several readers have, over the years, asked about how I do pattern placement on my paper doll clothes. I actually use several different methods depending on the complexity of the pattern and the shape of the underlying garment. Today, I am going to show you how to place a pattern onto a garment in Photoshop where the garment does not have folds, pleats or ruffles of any kind. Garments like that include pencil skirts, most pants, most coats, many knit tops and suits. Really anything made of fairly structured fabric or style. That you have a working knowledge of Photoshop. I use CS5, but this should work in other versions. Nothing I am doing here requires fancy tools, but it does require the use of layers, the Magic Wand selection tool and the eraser. Motif: A Motif is the individual pieces that make up a pattern. A single pattern might have lots of motifs. Repeat: The spacing between the motifs that make up a pattern. All patterns have a specific motif size and each time the motif (or motifs) duplicate that is a repeat. This rarely matters in paper doll clothing, but it’s an important thing to think about when planning your pattern. Directional Patterns: A pattern with a clear direction, the most obvious example is stripes, but a lot of patterns have a “top” and “bottom”. Pattern Matching: How well the pattern has been matched across the seams or different parts of a garment. Distortion: Okay, so this term is one that I made up, but I use it when I am thinking about how the fall of the fabric or the shape of the body beneath the fabric distorts the pattern. Since our example romper has no folds or pleats or other things, we get to ignore this right now, mostly. Not entirely mind you, but mostly. This paper doll romper is made from two different fabrics. One is the trim around the neckline and belt, along with the ribbons. The other is the main body fabric. Because fabric is flat and humans are not flat, clothing is made up of various pieces of flat fabric which, once joined together along seams, make up garments. Take, for example, a t-shirt. There is a front, a back, two sleeves, and likely ribbing around the neckline. If the fabric making up that t-shirt is patterned, than the pattern has been cut to make each of those five pieces. That means that where the pieces of fabric meet the pattern may not line up perfectly. This is known as “pattern matching.” Pattern matching is generally well done on more expensive garments and often poorly done on cheap garments. On paper dolls, it sometimes looks better to “badly” match your pattern, since that provides a reminder that the garment is made up of different pieces. 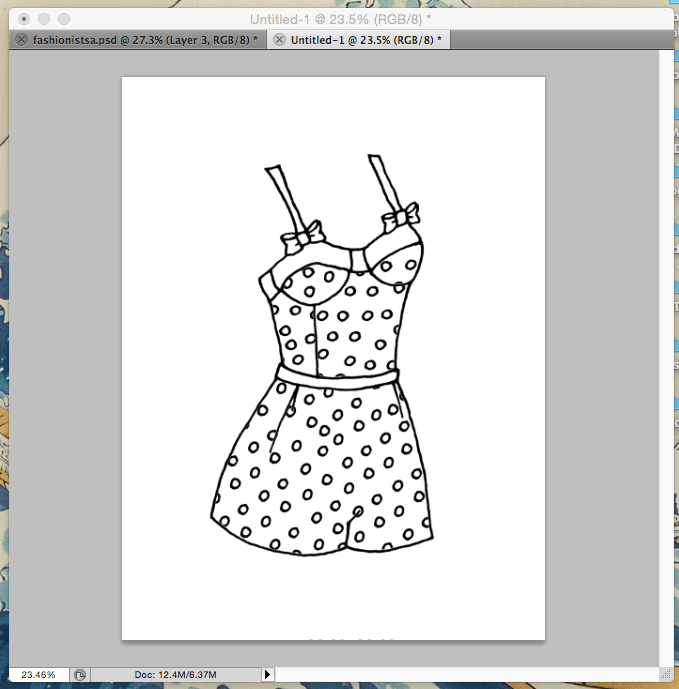 The pattern we are making (which is polkadots) will be applied to our romper. The romper is on the right. I highlighted each section of the romper in a different color to illustrate the number of different pieces that make up this garment. Having some idea of which parts of the garment were cut from different pieces of fabric will tell you where the pattern should be broken up. It will also allow you to decide where you don’t necessarily want pattern. On this romper, I am going to leave the trimming plain. So, to begin with you have to draw something you want to give a pattern and you need to also draw your pattern motif separately. This is the romper I’ll be working on. It is on one layer in Photoshop. It works best to have your “design” on one layer and your motif on a layer above it. 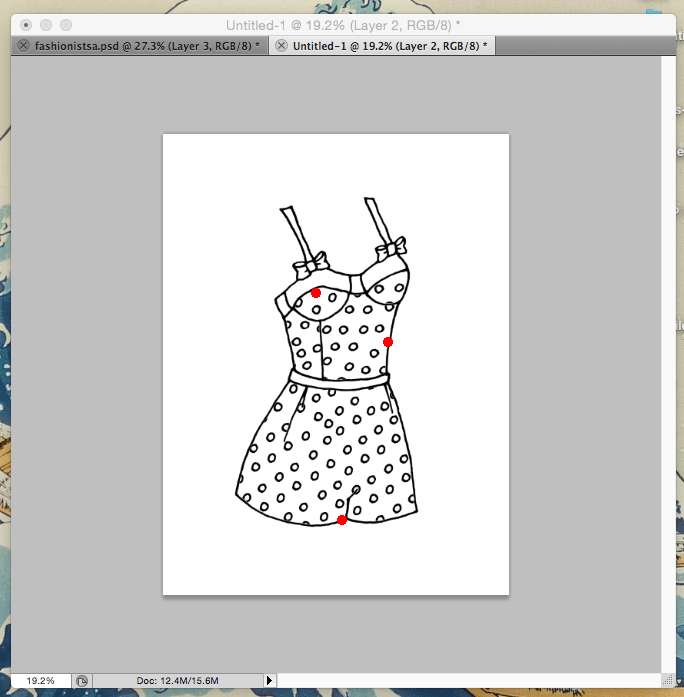 So, copy your motif and remove any background that might be there and then past it onto a layer above the romper layer. As you copy and paste your motif (or motifs) repeatedly, eventually you will end up with a large swatch of pattern. I like to make sure that my pattern swatch is large enough to cover the garment or at least most of the garment before I stop. Now, technically, I could stop right now. Clearly, I have enough polka-dots to cover the whole romper. However, if you stop here, than your garment will look flat, because this takes into consideration neither the distortion of the body nor the multiple pieces of fabric in play. At this stage, I always copy my pattern layer. I like to have a “back-up” pattern swatch in case I end up really disliking how the whole thing turns out. Doesn’t happen often, but it certainly has happened. You can see the two layers of pattern on the side of the screen shot. Now, using the magic wand selection tool, select which areas of the garment you want to apply pattern to first. To do this, you will have to be on the “garment” layer. In my case, I started with the shorts and the bra cups. After you have made your selections, return to the pattern layer and inverse your selection as shown in the image above. 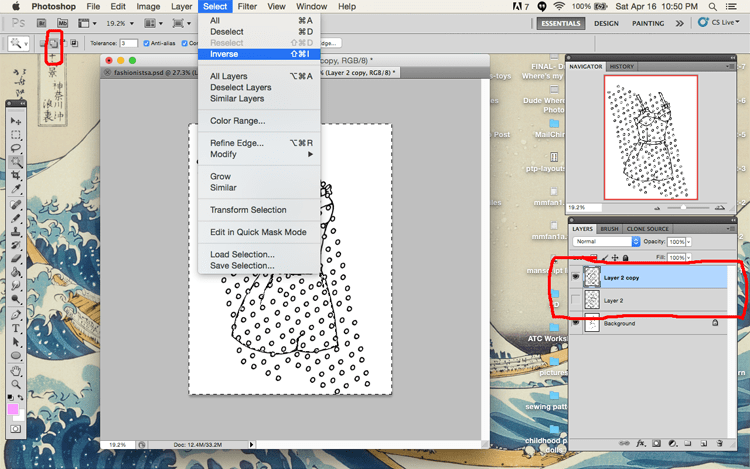 Then hit delete to remove the parts of the pattern NOT in the selection area. Here is how the romper looks now. For each section of garment you add pattern to rotate the pattern slightly in order to capture the sense of different pieces of fabric. Even after you have filled the entire garment with your pattern, there maybe places that there is a strange gap or a misplaced motif. After careful examination of my finished patterned piece, I decided there were a few spots which needed additional polka-dots to look right. I’ve marked them in red on the image above. 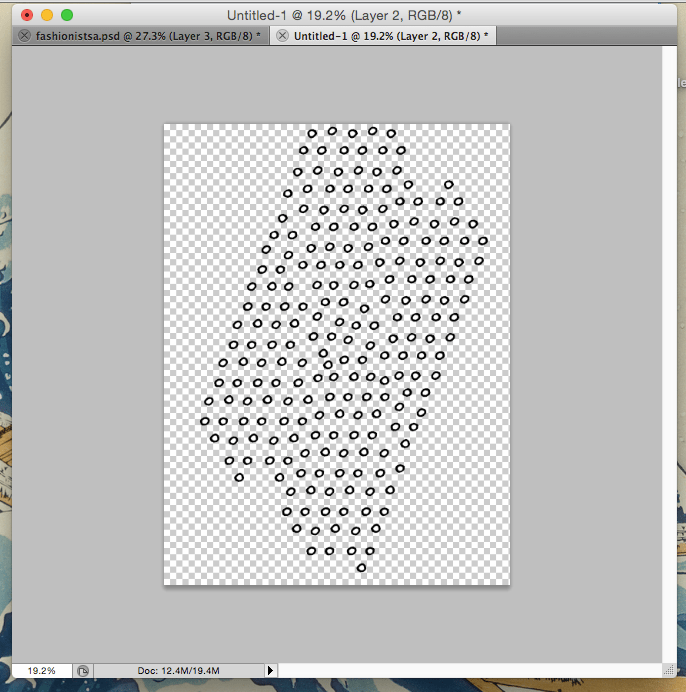 After filling in those spots, I cleaned up the edges of the additional dots with the eraser tool. The last step is to merge the pattern layer with the garment layer and then we are done! Big round of applause everyone. Patterns wrap around and therefore many motifs maybe cut off on the edges of the garment. The more complex or larger the motif, the larger the garment, or you may not be able to see the whole motif. With more complex motifs it is also sometimes best to put them on simpler garments, or only on parts of complex garments. Now, the next steps to make this line-work into a finished product are to clean up the line work and then color the garment. Questions? Please feel free to leave a comment. Last time on Paper Doll Principles, we discussed Playability. Today, I am going to talk about Diversity. Playability: Every paper doll must be a functional toy. Artistic Quality: All paper dolls must be beautiful before and after they are cut out. Diversity: Every person deserves a paper doll that affirms their existence. Now, let’s talk about paper doll diversity. Dover’s excellent book about Famous African-American women. Seven or eight years ago, back when PTP was just a thought in my head, I was looking through my own paper doll collection and I discovered that I owned no black paper dolls that were not either paper dolls of actual people (like Dover’s excellent Famous African-American Women) or paper dolls of ethnic dress (like Traditional African Costumes Paper Dolls ). I don’t recall what made me dig through them looking for one, but I remember being surprised by this discovery. I also didn’t see a single Asian paper doll that wasn’t wearing ethnic clothing, like Dover’s beautiful Japanese Kimono Paper Dolls or were of specific people. Now, my own collection is a small sample of the paper dolls created in this world, but it very much struck me at the time. I believe the omission of brown skin and Asian features from paper dolls is largely because in the United States, we default to the assumption that people are white. So, that is someone’s skin-tone or ethnicity is not stated, than white skin becomes the default. This is a phenomena which can be seen in more things than just paper dolls, but since this is a paper doll blog that’s what I’m focusing on. In recent years there have been several paper doll sets published by major publishers that have challenged this phenomena, including Dover’s Ballet Dancer Paper Dolls, Teen Pop Stars and Fashion Models paper dolls, all of which feature four dolls in four different skin-tones by Elieen Russel Miller. China Town Paper Dolls by Kwei-lin Lum is another excellent set that celebrates the history of Chinese Americans in this country. I’m sure there are more, but these are the ones that I am currently aware of. While I would still like to see more of this, I do think it’s a wonderful sign that this might be changing for a more diverse paper doll world. When as an artist, I depict people who are not like me, I believe I have a huge responsibility to do so with respect and care. There have been many unfortunate paper doll depictions of African-Americans in this country. Arabella Grayson, a passionate collector of black paper dolls, writes about this on her wonderful website 200 Years of Black Paper Dolls. I am unaware of a similar project documenting paper dolls of other ethnic groups, but if anyone knows of one, do tell. I am not perfect in this regard, but I decided years ago that I was going to try to create paper dolls that didn’t default to white. So, if you want a brown skinned paper doll wearing 1910s suits, I can hook you up. If you want a curvy, Asian, post-apocalyptic paper doll, I got that too. But there are also times when the best of intentions, can become problematic. Cultural appropriation is a complex, nuanced, and often very difficult world to navigate. So, I am going to talk about not my successes in paper doll diversity, but what I think of as one of my failures. This could totally be subtitled, “One Paper Doll Rachel Kinda Regrets”. So, back in 2011, I drew a paper doll called Inspired by Africa. At the time, I had been asked to do an African inspired fantasy set by a reader. Naively, I drew the set, not really knowing what I was doing and then proceeded to post about it, making it as clear as I could that it was a fantasy set. And I moved on with my life and kinda forgot about it. The Inspired By Africa set which I worry is promoting stereotypes about Africa. Two years later, in 2013, I noticed that Inspired By Africa had been linked on a forum for homeschooling stating that it was a paper doll of African ethnic costume and I couldn’t have been more mortified. To make matters worse, when I followed the link from the forum post to the original site, I found a webpage where someone had made the same statement and provided a link to the paper doll. So, I emailed the site owner and asked to have the descriptive text changed to “fantasy”. Even after all of that, when I look at that paper doll set, I have reservations about it. Despite all those second thoughts and worries, I haven’t taken her down, because one of the comments on that post came from a young girl living in Nigeria who said she loved the set. And yet, I don’t know what I would say to someone if they asked me too remove it or told me it was stereotypical and problematic, because it is. Moral of the Story: This stuff is WAY more complex than just throwing some brown skin on a princess and calling it good. The way people are depicted does matter, and as artists, we are responsible for our art. We are also responsible for recognizing that our art has a life of its own. Once created, our audience is not obligated to come back to us and ask what we meant. The art will be, and should be, judged on its qualities and not the intention of the artist. In short, it doesn’t matter what you “meant” it matters what you did. Should I take down "Inspired By Africa"? Edit: There was a problem with the poll this morning, I thought I had it fixed, but I was wrong. It is now officially fixed. Sorry about that, but thank you to everyone who commented. Comments? Questions? Have you ever drawn something you regretted? What did you do about it? What responsibilities do we as artists have to the ethnicities and races we depict? I don’t talk a lot about the “craft” of paper doll making. How to make paper dolls just isn’t something I tend to discuss. I don’t know why that is exactly, though I suspect there’s some deep seeded insecurity in play there. Well, all that stops now! This is the first of a series of paper doll posts I have planned on how to make paper dolls. And I sincerely hope that some of my fellow paper doll artists will chime in with their thoughts in the comments. The first thing I want to do is introduce the my paper doll principles. The things that I believe are important when I design paper dolls. Each of these qualities is important. However, were I am pick one to focus on the most, it would be Playability. Playability is a term that evolved in the video gaming community. It refers to how well a video game can be played. For me, I think of it as a way of measuring how well a paper doll can be played with. In this set the shoes are individual and wouldn’t work well for an playable set. While pretty, this set really fails the “playabilty” standard I now hold. Does the clothing fit? Does the doll stand up? Do the tabs keep the clothing on? How many outfits does the paper doll have? How many mix and match pieces? If it’s a paper doll with just one dress, that’ll get boring fast. 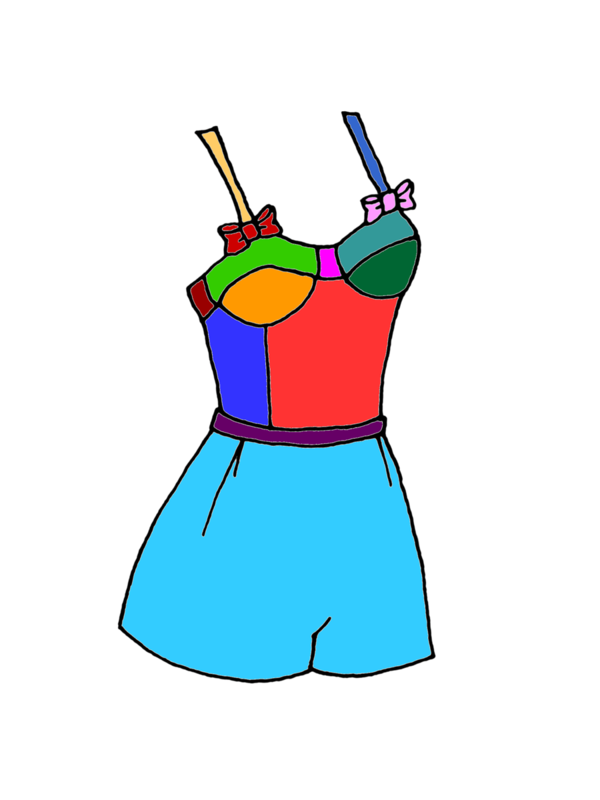 What is the theme of the paper doll? How well does the paper doll reflect the theme the artist has chosen for her? Now, if I told you I thought every paper doll set in Paper Thin Personas got a perfect score in all these categories, I would be lying through my teeth. You have to balance these things. Shoes can be attached to the paper doll figure directly, if desired. Paper dolls need shoes and shoes pose a unique challenge. There are three solutions for paper doll shoes. Attach them permanently to the doll. Attach them permanently to an outfit. Option 1: Great for functionality, because you can not possibly loose the shoes. Unfortunately, it also means the shoes can’t be changed. (Functionality over Versatility) A few examples include Cora in Stripes and Her Ladyship. Option 2: Keeps the shoes from getting lost, but also limits the mix and match options. (Functionality over Versatility) A few examples from my site include Ethan, Best Friends, Sci-Fi Girl and Bone Fairy. Option 3: It is easy to lose the shoes in this option, but they can be changed which is fun. (Versatility Over Functionality). Individual shoes are both too easy to lose and tend to fall off. The best two ways to have interchangeable shoes are to attach them to a base or to attach them together. Choosing the best option comes down to the third playability concept- Theme. Most of my paper dolls have separate shoes attached to their stands, because they are intended to be a series where any paper doll could share with any other paper doll. If your plan is to have the paper doll in some sort of underwear that is specific to her time (Victorian doll of 1886) or theme (fantasy lady like Her Ladyship) than the best option is to attach the shoes, I think. In this case, Theme over-rides the needs of Versatility. If you plan on creating a single base doll and then having lots and lots of different themes around that doll (most of my paper doll series) than Versatility overrides the needs of Theme and simple undies, plus removable shoes are best. If you plan on changing the dolls poses through their clothing OR making the clothing in a single piece (not mix and match), than I think the best option is to attach the shoes to the outfits as I do in Cybergirl or Spring. This is also the technique usually used by Boots of Pop Culture and Paper Dolls for her Star Wars paper doll series. Also remember, you can do more than one at the same time! Her Ladyship has shoes attached, but she also has ice skates. You can also put shoes on the base doll AND put shoes on the outfits. I couldn’t find an example of this in my archives (weird, but true), however, it can be done. Moral of the Paper Doll Shoe Parable: How you balance the issues of playability is all about your intent as the artist. Never forget you are gaining and losing things each decision you make. And you are making decisions, even if at times you don’t notice. So, is playability the most important factor? Some collectors paper dolls are never intended to be cut out. These paper dolls value artistic quality OVER playability. That is okay. Some of my own work falls into that category. As I have gotten more experienced, however, I have come to view playability as one of the most critical factors in paper doll creation. The paper doll has to work, even if you would never cut it out. The clothing needs to fit. The tabs need to work (if you draw tabs) and the thing needs to be functional EVEN if you don’t imagine anyone will want too actually play with it. And that wraps up this first installment of Paper Doll Principles. What would you like me to talk about in this series? Any questions about paper doll creation? What do you think about these principles? Is there something I missed? What makes a “good” paper doll for you? After I wrote my tutorial on how to clean up line-work, it occurred to me that I should talk a little about scanning. I didn’t have space to do it in the linework tutorial, but I do have a few thoughts on scanning. Here’s some advice from someone who scans a lot both for my hobbies and for my job where I usually am the one digitizing historical materials. When I was first learning how to cut wood, I was taught- You can make a piece of wood shorter, but you can’t make it longer. In other words, cut a little bigger if you have to choose. Since slicing off an inch is easier than realizing you’re short an inch. You can always reduce the resolution of an image, but increasing it will result in loss of clarity. Resolution is something people seem to get confused about, so let me try to explain. Resolution is always measured by the number of dots per one linear inch (in the US, other places use the centimeter). This is shortened to DPI (Dots Per Inch) for as most printers or Pixels Per Inch (PPI) for digital media. Some professionals work as high as 1200 DPI, but I think that’s a bit much. Bare in mind that professional publications are usually printed between 300 and 400 dpi. Choose your File Format Carefully. There are many digital file types. I’m going to talk about a few common ones here. “JPEG” stands for Joint Photographic Experts Group- a fact mostly useful to show off your knowledge, but won’t really matter much. It is sometimes also called a .jpg or a jpeg. JPEGs are always compressed files. JPEG is designed for compressing either full-color (24 bit) or grey-scale digital images of complicated real world images (photographs). It is a great format when there is subtle color change in an image, but using a high compression rate can result in loss of quality. “GIF” stands for Graphics Interface Format. It is an 8 bit format meaning that maximum number of colors supported is 256. GIFs are always compressed and rarely used these days. “PNG” stands for Portable Network Graphics format. This was an updated version of the “GIF” format and literally supports millions of colors. It is the format I usually use for my web posts as it tends to compress to a small size without loss of detail and my paper dolls are full color without a lot of subtle shades. PNG has largely replaced GIF on the internet. “TIFF” stands for Tagged Image File Format. TIFF was originally designed for scanners as a universally acceptable format in a time when scanning companies all had different formats they were using. TIFF images are not compressed as a default setting. This is the preferred format for archival scanning, because there is no compression. However, the lack of compression results in very large sized files. Therefore, TIFF files are rarely posted or shared on the internet or printed from. TIFF files can handle bi-level (black and white), grayscale, palette-color and RGB full-color images. When I scan, I scan at 600 dpi as an uncompressed TIFF files in greyscale, since I work in black and white. I call my rough scans “raw files”. Theses are my 600dpi uncompressed TIFF files, usually in greyscale. They are very large files. I keep them in a folder called “Raw Files” it contains all the raw scans dating back a long long way. Sometimes, you have to go back to the very beginning, so keep a copy of the unaltered scan in case you need it. Know you Scanner and Choose it Well. I have used HP scanners, Epson scanners and Canon scanners. They are all a little different. Learn your scanner settings. Read the manual. Get comfortable using it. If you are scanning full color art work, than carefully check how many colors the scanner can read. A colored pencil drawing, for example, can literally have millions of subtle shades. If your scans are coming out poorly, than is it your scanner? Your scan settings? Or can your scanner just not handle the color depth. I don’t own an expensive scanner. I use an all in one printer with a cheap scanning bed. I work in black and white, so I don’t worry about color loss. If you do worry about color loss, invest in a good quality scanner. If you do invest in a good scanner, avoid letting it get bumped or knocked around. Before I scan, I erase all my line-work carefully, than I correct any problems I see. I stick a piece of white paper between my sketchbook page and the next page, so the image on the page behind won’t bleed through. These things make sure my scan comes out pretty good the first time. Re-scanning at the high resolution I want in takes time and I don’t always have that time. So, these are my rules of scanning. What are your rules? Anything important that I missed? Let me know in a comment. 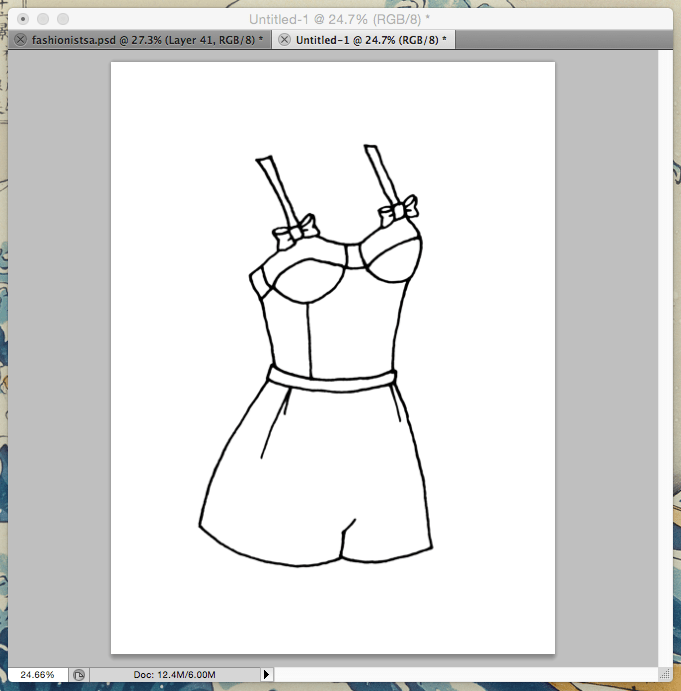 Today, I am please to present a tutorial on how I prep my scanned line work for paper doll sets. I was asked some questions about this by Bethany, who shows off her paper dolls on her Pinterest board. In this tutorial, I will show you how I clean up linework from a rough scan to an image with only black & white. I don’t know if this is a perfect set of instructions, but I have done my best to encapsulate the process I use. 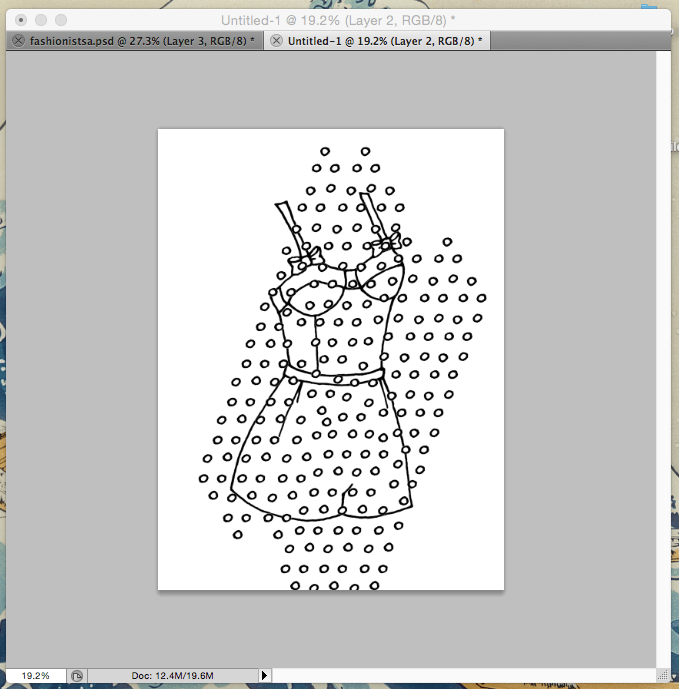 Before you begin, you will need your scanned linework. I scan at 600 DPI, but other people scan at other things and that’s okay. Load your scan into your version of Photoshop. I use CS5 and CS3, because I am quirky. Ready? Okay… let’s do this. Step 1: This is Your Scan. 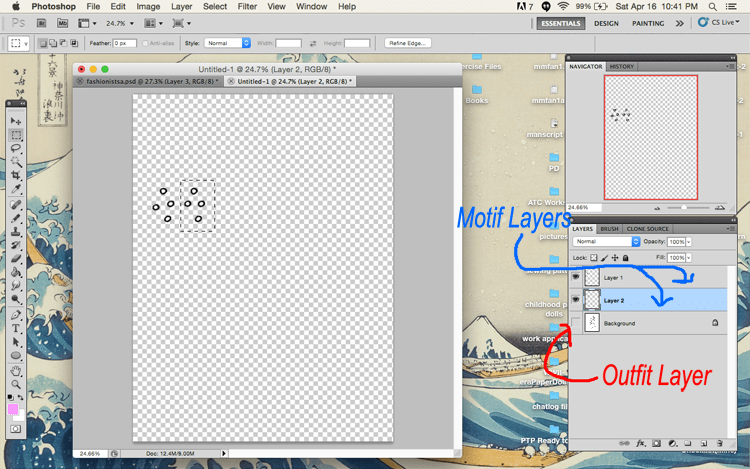 In the image above you can see my 600 DPI Tiff that I have opened in Photoshop. My scanning bed is just a little too small to fit my 9 by 12 sketchbooks, so normally I scan in two parts and then join those parts using Photoshop’s automated picture combine features. In the end, this is what the scan looks like right before I am ready to start cleaning it up. As you can see, this is for a majorette set for Marisole Monday & Friends. Now… let’s get ready to mess with it.